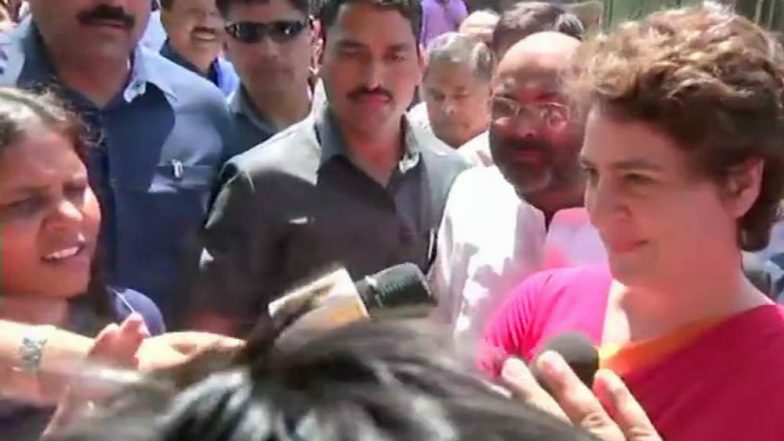 Lucknow, March 19: Congress General Secretary Priyanka Gandhi Vadra, who is undertaking a boat ride from Prayagraj to Varanasi in the Ganga, on Tuesday made a scathing attack on Prime Minister Narendra Modi led government at the Centre and said they can no longer hide behind 'What did they do in 70 years?' argument. Priyanka Gandhi said it is high time the Modi government tells people what they have done in the last five years. "'What did they do in 70 years?' argument also has an expiry date. Now they (BJP) should tell what they have done in their five years when they are in power," Priyanka said. The Congress leader also took on Chief Minister Yogi Adityanath led government in Uttar Pradesh said every section of the society is in distress under the current regime. She said the ground reality is far from what the Bharatiya Janata Party (BJP) is showing in promotional ads. Priyanka Gandhi Vadra's Reply When Asked if She Would Contest 2019 Lok Sabha Election. "The report card, promotions, all of it sounds good but there's nothing on the ground. I'm meeting people every day. All the people are in distress," Priyanka said. Earlier today, she offered prayers at Sita Samahit Sthal in Bhadohi. On Monday, Priyanka also took a dig at PM Modi's 'Main Bhi Chowkidar' campaign. "It is up to him what prefix he uses in his name. Yesterday, I met a group of farmers. One of them told me, chowkidars are for the rich. We farmers are our own chowkidars," she said. Priyanka Gandhi Not Be Allowed to Enter Kashi Vishwanath Temple: Lawyers to DM in Letter. The BJP, however, downplayed Priyanka's 'Ganga Yatra' equating it with a picnic. "There are some families, in the past, they were called ‘Rajgharana’. They come in the election season to celebrate picnic and return only after 5 years. It is obvious, that this ‘boat yatra’ is for the vote only," Deputy Chief Minister of Uttar Pradesh Dinesh Sharma said. Uttar Pradesh will go to polls during all seven phases of the Lok Sabha election to be held on April 11, April 18, April 23, April 29, May 6, May 12 and May 19. Counting of votes will be done on May 23.